United Arab Emirates. Wednesday, 13 June 2018/PRNewswire/-- A new elite international T20 cricket league, organised in partnership with the Emirates Cricket Board (ECB) and sanctioned by the International Cricket Council (ICC), is set to take place in the UAE this December 2018 – January 2019. 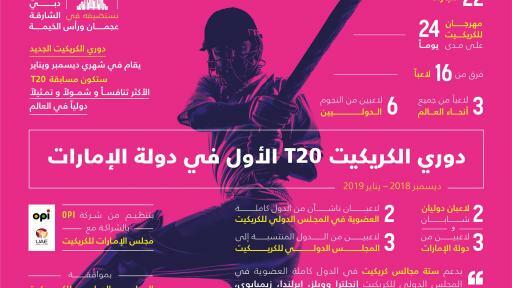 The UAE-owned tournament, the name of which will be unveiled in July, will make its debut in Abu Dhabi, Dubai and Sharjah with five new franchise teams vying for the inaugural title in a 22 match format to be played over 24 days. "Our whole focus of what we are trying to do here is to attract talent from all around the world to take part in this competition to help develop young cricketers from Associate Member nations who may have not had the opportunity to play at the highest level in the past," said David East, CEO of the ECB. 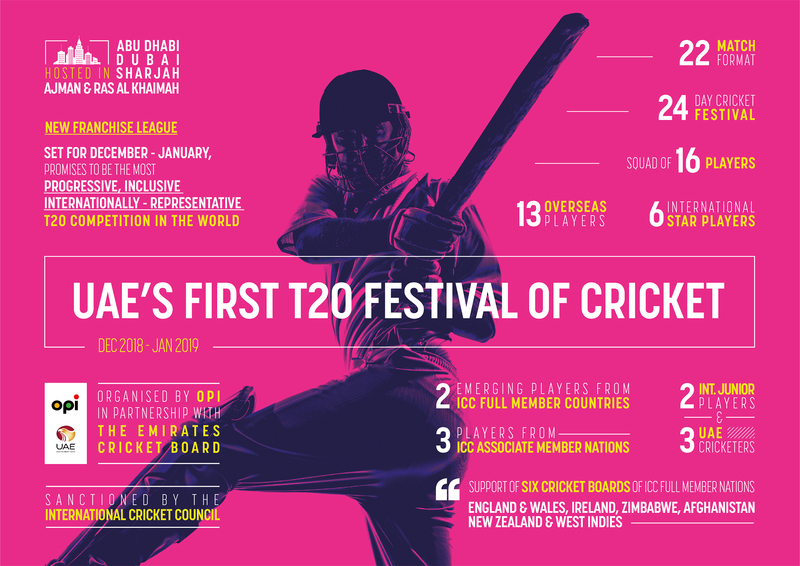 This new festival of cricket aims to be the most innovative and inclusive T20 competition in the world with its unique franchise player roster composition, also making it the most internationally-representative. It will provide opportunities for cricketers from both ICC Full Member and Associate Member countries as well as juniors alike, to play with and develop their skills alongside the very best in the world. The five franchises will comprise a squad of 16 featuring six international star players, two emerging players from ICC Full Member countries, three players from ICC Associate Member nations, two Junior Players and three UAE cricketers. 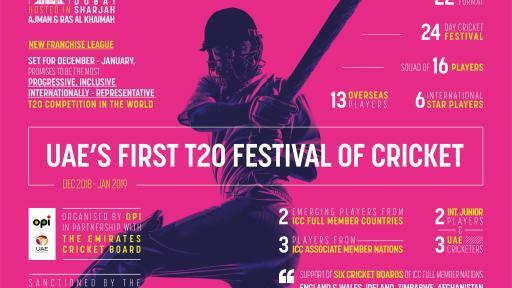 No other T20 competition has been established with these developmental goals at their core, and no other event will showcase such a wide array of international talent. "This competition will introduce the sport to new audiences in the UAE. We want to stage a festival of cricket that is designed to bring the game to all corners of the country and to support grassroots and local cricket," said Zayed Abbas, ECB Board Member and Official Spokesperson. Cricket is already the second most followed sport in the UAE, with an ever-growing following amongst the population. The high volume of world-class cricket having been played in the UAE over the past five years, has been really important in growing the sport’s popularity in the country. The event has already received the support of six cricket boards of ICC Full Member nations – England & Wales, Ireland, Zimbabwe, Afghanistan, New Zealand and the West Indies – and organisers are looking forward to receiving the support of the ICC Associate Member countries, boasting some of the best top emerging cricketers in the world. More Full Member nations are expected to lend their support as we move forward. Hosted in one of the most unique and desirable locations in the world, the new competition will reflect the UAE's desire to push the realms of possibility and use its unique position as a hub for world-class sport to become the new centre of the cricketing world and the development of the game. With innovation at its heart, this new event will be the latest UAE national sporting asset, aiming to leave a lasting legacy for the game, sport and health and fitness in the UAE and across the region. Dr. Nasim Ashraf, Chairman of the T20 League Board of Directors, former Chairman of the Pakistan Cricket Board (PCB) and ECB Board Member, explains that the new competition has been conceived to be a unique platform for the development of the best young cricket talent from around the world. "Our intention is to build a new event that is here to stay, and one that occupies a niche position in the international cricket calendar. We are not looking to compete with other T20 leagues, we are looking to develop an international festival of cricket that exists first and foremost for the benefit of the players, and with a very specific goal of helping to develop new talent from around the world and grow the game in keeping with global best practices," said Dr. Nasim. “Our players will be at the heart of the action, entertaining and playing the game to the limit, looking to make a name for themselves and a mark on the world of T20. The diversity of players that will compete in this new event will represent the great diversity of the UAE – players of all nationalities love playing and staying in the UAE, with a lifestyle beyond compare. This is a chance for them to come to a winter sports super hub and play 7 star cricket in a competition that will be world-class in its design, organisation, management, quality, sound practices, compliance with rules and regulations, profile, innovation and fan experience," he added. 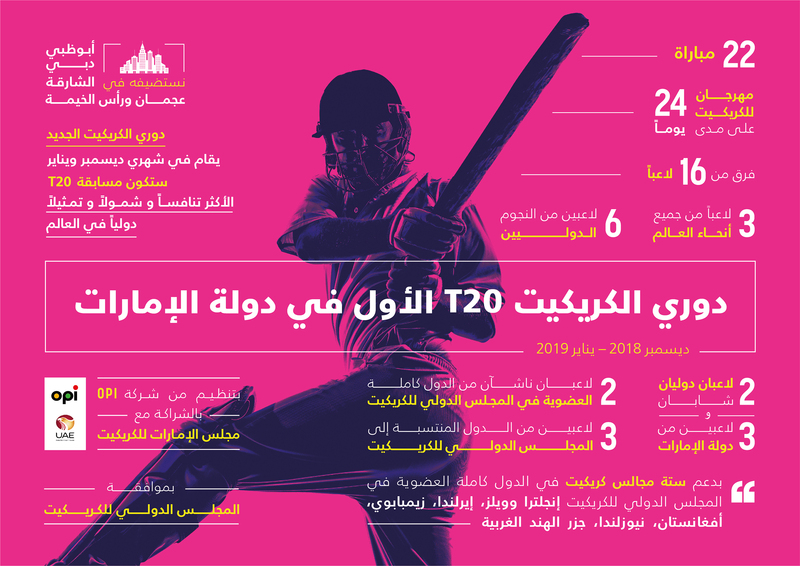 The new event is being built to ensure it is a commercially sustainable platform of high strategic value towards the promotion of cricket in the UAE and internationally for sponsors and franchise-owners alike. The franchise model has been developed using best practise and learnings from the organisers’ experience in sports franchising and international business and is set to offer franchise owners long-term returns and a unique platform to engage with consumers and businesses alike. It is a model and format that has seen the competition be granted a ten year sanctioning from the world governing body for cricket, the ICC. Further details on the new competition, including its name, schedule, ticket categories and packages, will be released over the coming months.